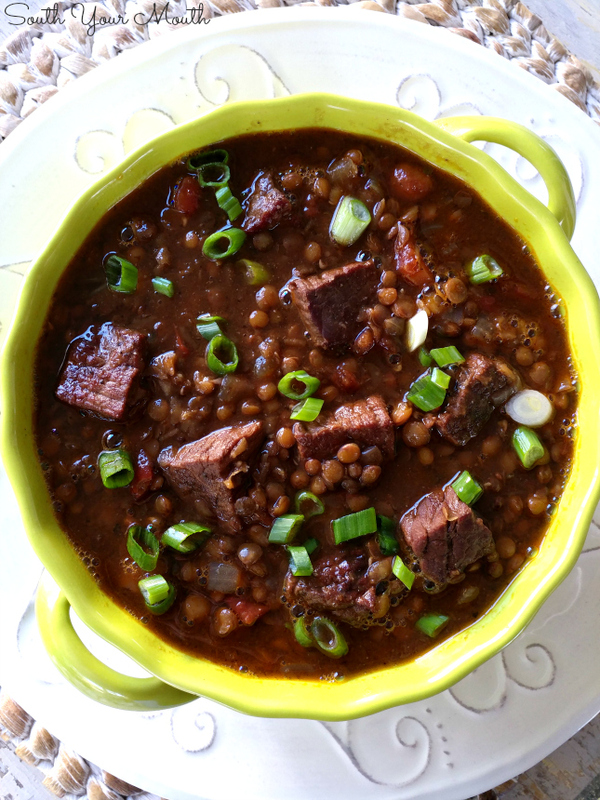 A hearty beef stew made with london broil, sirloin or chuck, a rich beef stock and tender lentils. Sometimes things don’t work out like you’d planned. Like, when you plan on making this amazing steak chili idea you came up with and you go and buy all the stuff you need like a two-pound slab of London broil, cilantro, spices, canned tomatoes, sour cream, etc. and you start pulling everything out to get it going and you realize you can’t find your beans and you refuse to go back to the store. So you come up with a new plan. And the new plan ends up being amazing. After I’d said a lot of bad words, ransacked my kitchen and slammed a dozen cabinet doors, I accepted the fact that my Hurst’s chili beans were just gone. GONE. To where? I don’t know. One of the kids probably got bored and glued them to cardboard when I wasn’t looking. But lucky for me, my pals at Hurst’s keep me supplied with an arsenal of dried bean goodness so I inspected my stash. I kept eying the confetti lentils because lentils are my new obsession. 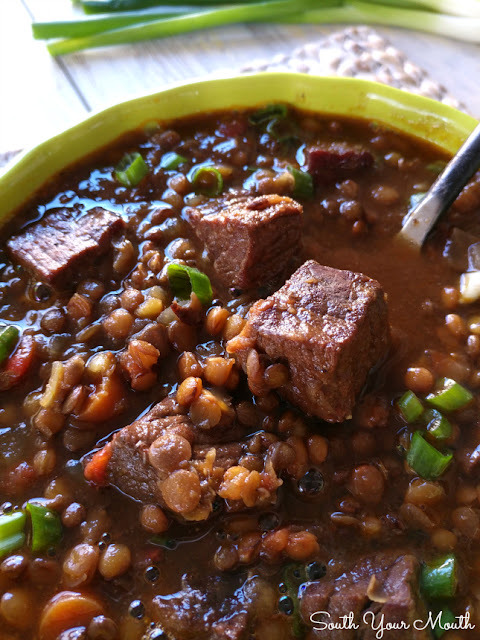 I knew I had to use that beautiful hunk of beef so I googled “beef and lentils” and found out that beef and lentil stew is a thing! I was going to make it a thing anyway but it was comforting to know I wasn’t the only one out there who thought this would be a good combination! If you love beef stew and you love any Southern pea, you will LOVE this stew! It’s hearty and warm and delicious! Because I’m addicted to it, I ended up making a pot of rice and served the stew over rice. I LOVELOVELOVELOVE eating peas over rice with some fresh sliced tomatoes and that’s exactly what it reminded me of! 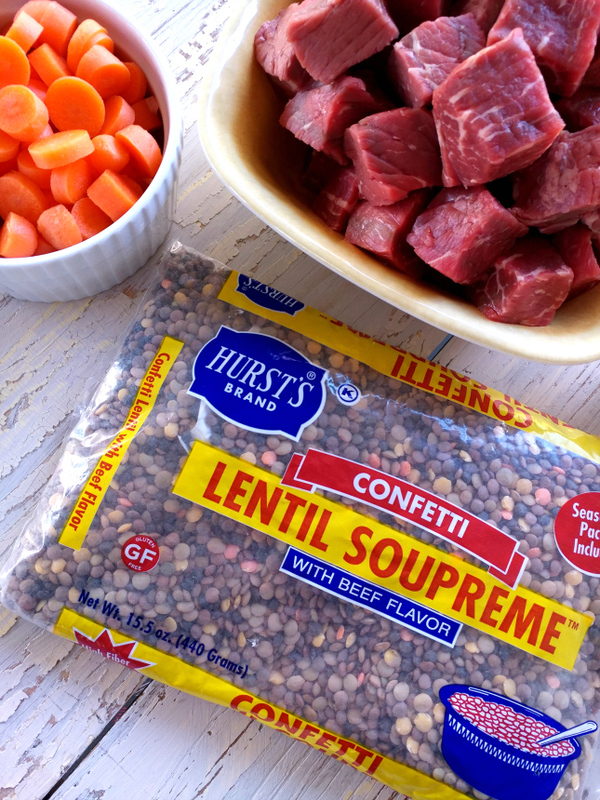 If you can’t find Hurst’s Confetti Lentil Soupreme in your local grocery store, ask for it! My grocery store now carries all sorts of products they didn’t have before simply because I asked for them. Cut beef into 1-inch pieces. Season liberally with salt and pepper. Heat 3 tablespoons olive oil over medium-high heat in a Dutch oven or soup pot. Add half of beef to hot oil and sear on all sides. Remove beef from pot, set aside in a bowl (to catch all the juices), then repeat with remaining beef, setting it all aside for a bit. Add onions and carrots to the now empty pot. Season with salt and pepper. Add 1 additional tablespoon of olive oil if necessary then sauté veggies for five minutes. Add minced garlic and continue cooking for 2 minutes. Add red wine then stir to deglaze the pan. Let wine reduce for 3-4 minutes. Add beef broth, water, tomatoes (undrained), Italian seasoning, garlic powder, salt and reserved beef then heat until simmering. Once simmering (not boiling – never let meat boil or it will get tough), reduce heat to medium-low, cover and simmer for 30-45 minutes. Add lentils with included beef seasoning packet. Increase heat until pot is simmering again, then reduce heat, cover and continue simmering for 45 minutes. Remove from heat and let rest, covered, for 20 minutes then serve. Serve with crusty bread or, if you’re a die-hard, rice-eating southerner like me, serve over rice. Garnish with chopped green onions if desired. Recipe makes approximately 10 servings. If you can’t find Hurst’s Confetti Lentil Soupreme in your market, please ask your grocer for them. 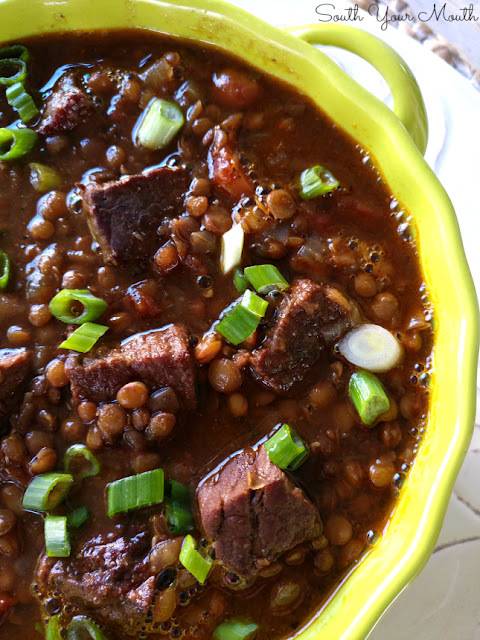 Until then, you can order them online or use 2 cups mixed dried lentils, substitute water with additional beef broth and add 2-4 beef bouillon cubes (to taste – not all beef broths are created equal so you may need more bullion for flavor). You don’t have to use wine (though I highly recommend it). Substitute with water or broth. Feel free to add other veggies to the stew. If I’d had celery laying around, I prolly would have thrown some in there. Thank you sharing the story, so well known situation :-) Glad it turned out the best. Will definitely make it. have a pleasant day ! I love how stuff just seems to walk out of the pantry! When my girls were small, they "borrowed" a bag of dried navy beans. I came downstairs to discover them strewn EVERYWHERE in the living room and dining room... those little stinkers had made up a new game called "planting the seeds." Took forever to get them all cleaned up (rolls eyes). Oh, and I am gonna make this stew... looks soooo good! Made this tonight! It is sooooo good! The *only* thing I did different is that I added different meat....I added some chicken/apple sausage and I used hamburger (it's what I had) and I added some cooked quinoa (cuz it needed to be used up) It is SOOOOOOOO good!! oops so I did 2 different things.